After having company this past weekend and trying out LOTS of new blog worth recipes, I had a ton of left over ingredients that I didn't want to go to waste. I had a little of this and a little and no direction for a complete meal (and a strong will NOT go to the grocery store with perfectly fine random items that needed to be used) so instead of making our normal Sunday meal together, Todd and I opted for some heavy hor d'oeuvres for the football game and decided to skip dinner all together. So, a "meal" of appetizers came together. First up, this bruschetta that I have had in the "want to make" pile for quite some time. I love that it is so simple, yet the flavor is so complex. My only two suggestions are to use really good blue cheese and good honey, because it does make a difference. I tend to always have these items on hand as staple ingredients yet have never thought to use them in this way. Don't get me wrong, honey and blue cheese sound great together, I just wasn't clever enough to think it up. I am glad I tried it because this is going to be a great "go-to" recipe for times when you are faced with a surprise guest or impromptu gathering. I don't suggest pre-making this as it's best served while still warm. 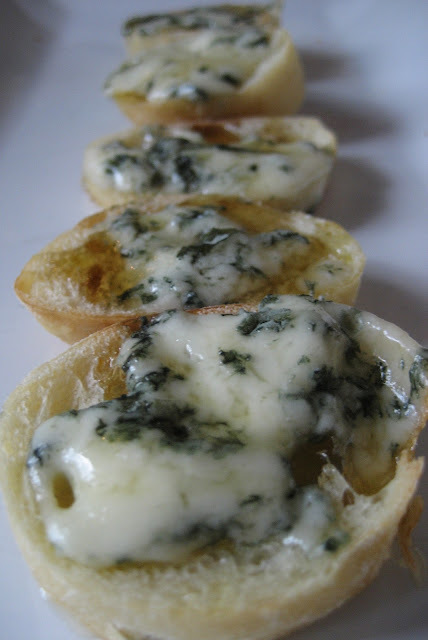 Take out of the oven and spread blue cheese on top of each slice of baguette. Return to the oven for 2 minutes or until cheese is soft and beginning to melt. Remove from oven and drizzle each slice with honey. Note: To make this recipe with little twist, substitute raw or baked pears instead of baguette!